Shipping: Based upon some of our manufacturers’ shipping preferences, a particular shipping company may be used. We will provide the particular tracking number for your purchase as soon as it’s shipped. You will be notified by return email with the tracking number. 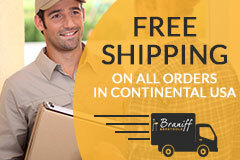 We will ship your order using the fastest, safest, and most reliable method possible. We have established strong relationships with some of the best delivery companies in the country. Every product on our site has been carefully selected to ship by a particular shipping method in order to provide you with an optimal delivery experience. We will notify you by email when your order ships. Included in your email will be a tracking number for your shipment. We encourage you to track your package online or on the phone with the carrier. Most companies can provide an estimated delivery date. Be sure to contact us if anything seems unusual with the progress of the shipment. Inside Delivery or LiftGate Fees: In some cases, your order is shipped via common carrier (truck) delivery to your residential location. Occasionally, you might require assistance with an "inside delivery." We will contact you before the order is processed by the manufacturer if any such LiftGate or Inside Delivery charges/fees will be incurred. Returns: When there is no return policy listed, it can be assumed that the product “CANNOT BE RETURNED”, with the exception being if it is damaged during shipping. There are times when these products can be returned, so contact us for clarification, BEFORE YOU PLACE YOUR ORDER. All costs of the return shipment are the customer’s responsibility and they must arrange for the shipment to be sent directly back to the manufacturer, ONLY after authorization by email or in written form has been obtained. Most manufacturers require that the products being returned be sent back IN THEIR ORIGINAL CONDITION AND PACKAGING. Therefore it is advisable to SAVE ALL SHIPPING BOXES as well as PACKAGING. If returns are accepted by a specific manufacturer, there is usually a RESTOCKING FEE (from between 10% to 25%). Our manufacturers will provide free parts or replacement parts for damaged or missing products. Some also provide 1-800 numbers (included in the product documentation) so you can receive the missing piece as quickly as possible. Cancellations: You can only cancel an order before it goes into production with a $25 Cancellation fee. If you wish to cancel a custom order that’s already in production, you might find that the manufacturers may refuse to cancel. Or if it has already shipped, they will require a large restocking fee, even before a delivery is made. All of your prepaid shipping fees are, of course, refunded in the event of cancellation before shipment is made. DAMAGED ITEMS: If by some unforeseen circumstance the items are damaged, or suspected to be damaged, it MUST be documented with the delivery company AT THE TIME OF THE DELIVERY. The driver must wait while you inspect the purchased items. If the driver refuses to wait while this takes place, you must make note of this on the waybill, WHEN YOU SIGN to accept the delivery. If there are signs of damage on the outside of the crates/boxes, you must also make note of this when you sign the delivery bill. Some of our manufacturers only make deliveries that are “curbside” and the driver will not carry the packages inside your home. Regardless of whether they deliver it to the curb and no further, or will take it into your home, if you notice any damage, note it on the delivery slip and insist that the items be opened and inspected. Once again, if the driver refuses, make sure that you note that fact on the delivery bill and get a copy for your records, or simply refuse delivery. In the event that there is damage, or suspected damage to any items due to shipping, you must notify this Web-site within three business days, either by phone, fax, or email. Our outstanding world class manufacturing partners stand behind all their products. 1. Behind every one of the exceptionally crafted bar stools offered on our site is a world class, company; most with more than 30 years of exemplary customer service and outstanding manufacturing expertise. 2. You get the very best quality table, chair, or barstool money can buy. Each item is backed by a warranty from a reputable company that guarantees all their products to be of the utmost quality. 3. Behind every Manufacturers’ Warranties are the best business practices and the most advanced technology available in today’s furniture industry. They use state-of-the-art technology in both the design and the manufacturing, to help give you the very best product possible. 4. They use the finest raw materials available in the market today to ensure that your product has a long and trouble-free use for many years to come. Your purchase through braniffbarstools.com will remain durable and look great for many years to come. SEE OUR MANUFACTURING PARTNERS’ WARRANTY STATEMENTS BELOW. Periodic inspection and maintenance ensures the durability and longevity of our seating products. The joints, welds, swivels and other stress points should be routinely checked, cleaned, tightened, and parts needing lubrication should be lubricated. Replace missing glides, screws or bolts. Use only the manufacturers’ replacement parts and instructions. A medium sheen sealer is applied to Special Grouping wood seats and backs. This sealer provides additional protection and is resistant to most stains resulting from food or drink. This finish is compatible with most commercially available alkaline-based cleaners. Our manufacturers use fire retardant foam that meet California Technical Bulletin #117, and most of their seating products meet or exceed NSF and BISMA standards. Regal warrants its products for one year from purchase to be free from defects in workmanship and material with normal use and service. This warranty does not include upholstery materials which are subject to whatever warranty is offered by the respective mills. The warranty also does not apply to any product which has been repaired or altered by anyone other than Regal, or has been subject to misuse or negligence. The factory will not assume labor charges for unauthorized repairs. Regal also provides a 5-Year Warranty free from defects in workmanship and material with normal use and service on a number of its metal frames bar stool and chair frames. 1) This warranty covers goods supplied by Holsag Canada against defects in workmanship and material except as specifically excluded, for a period of one (1) year from the date of receipt of the goods (unless otherwise specified). 2) The following are specifically excluded from the warranty: (a) Any custom components that are not part of the Holsag standard line. This would include (but not be limited to) custom designed parts or customer specified components such as fabric, vinyl, foam, etc. which are not part of the standard Holsag line. (b)Furniture that has been unduly exposed to the elements such as water, direct sunlight, etc. (c) Damage as the result of accident, fire, flood, civil disorder, strike, Act of God, abuse, misuse, or any cause outside of ordinary usage. 3) Holsag agrees to replace, repair or refund at its discretion, defective parts or workmanship. EXCEPT AS EXPRESSLY PROVIDED HEREIN ABOVE, THE MANUFACTURER MAKES NO REPRESENTATIONS OR WARRANTIES, EXPRESS OR IMPLIED, INCLUDING, WITHOUT LIMITATION, ANY WARRANTY OF MERCHANTABILITY OR FITNESS OF ITS PRODUCTS FOR ANY PARTICULAR PURPOSE, AND HEREBY DISCLAIMS THE SAME. THE REMEDIES SET FORTH HEREIN ARE EXCLUSIVE. LIABILITY OFTHE MANUFACTURER IS LIMITED TO THE ACTUAL REPAIR OR REPLACEMENT OF DEFECTIVE FABRIC AND DOES NOT INCLUDE INCIDENTAL OR CONSEQUENTIAL DAMAGES.